Dummies understand each other. 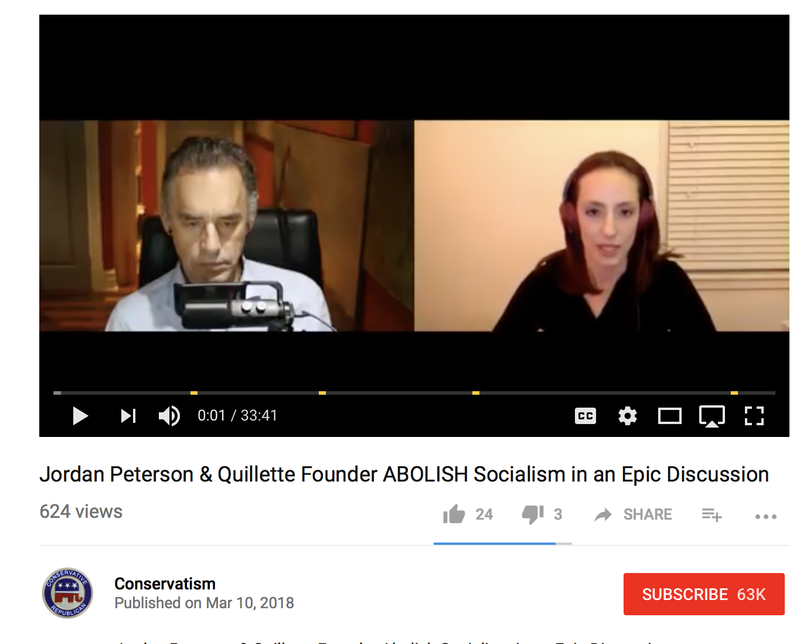 That's why we see alt-right Claire Lehmann supporting wacko alt-right Jordan Peterson, on the "Conservatism" Youtube channel. I have developed a strong aversion to the Australian dialect and it must be due to Lehmann. I used to think the dialect was charming when I heard Steve Irwin speak. In your new book 12 Rules For Life, you’re very critical of Frozen. Why do you call it “deeply propagandistic”? It attempted to write a modern fable that was a counter-narrative to a classic story like, let’s say, Sleeping Beauty — but with no understanding whatsoever of the underlying archetypal dynamics. You could say that Sleeping Beauty was raised out of her unconsciousness via a delivering male. Another way of reading the story is that unconsciousness requires active consciousness as an antidote. And the unconsciousness is symbolized in that particular story by femininity and active consciousness by masculinity. I could hardly sit through Frozen. There was an attempt to craft a moral message and to build the story around that, instead of building the story and letting the moral message emerge. It was the subjugation of art to propaganda, in my estimation. Peterson tips his hand and reveals that he seems to be angry because Frozen has a plot twist. Isn’t the darkness and the light in Elsa, who has the power to freeze things, for good or ill? The most propagandistic element of Frozen was the transformation of the prince at the beginning of the story who was a perfectly good guy, into a villain with no character development whatsoever about three-quarters of the way to the ending. He was a villain the whole time! He was a wolf in sheep’s clothing! That’s how it turned out in the end, but there was no indication of that at the beginning. That’s good story craft — not tipping your hand. Like The Crying Game. It’s certainly possible that I’m wrong about Frozen, although I don’t think so. I’m sorry. This is just the funniest thing I’ve ever seen. First off, he totally dodged Luscombe’s question about Elsa, because she is rather obviously correct that Frozen looks at both the light and darkness of having power—especially female power in a world that is afraid of it. But then we get this gem about Prince Hans: “There was no indication of that in the beginning.” First of all, did we watch the same movie? Sure, the hints were subtle—but like, by children’s movie standards. Did Jordan Peterson really watch the “We finish each other’s … sandwiches!” sequence and interpret it as an earnest, deadly serious indication of true love? By this logic, all murder mysteries ever written are vile propaganda. The Sixth Sense is a PSA. Macbeth is a Maoist poster. M. Night Shymalan is the one true propagandist of our age. Now, all that said, I would certainly agree that Frozen, like pretty much all works of art, does have an artistic and a moral point of view. (As George Orwell famously said, all art is in some sense propaganda.) But I will never stop giggling at the idea that it is uniquely propagandistic among all of Disney’s animated films, just because Prince Hans turns out to be evil and the story wasn’t around when the last woolly mammoth died. Come on, now. It's already clear that Claire Lehmann is not an especially bright individual and, perhaps as a result, she's placing her bets on patriarchy reasserting itself over feminism, possibly led by Jordan Peterson. Anybody who hasn't already concluded that Peterson is a clown is just... slow. There's no way around it. The only possible way Quillette can survive is if Lehmann is the recipient of wingnut welfare because it's not only transparently an alt-right publication, just one step up from Lehmann's former employer Rebel Media, it has a ridiculously amateurish and right-wing line-up of writers. Matthew Blackwell - currently completing a BA in Economics and Anthropology at The University of Queensland. William C. Vaillancourt - a recent graduate, majored in Poli-sci and history. Prior to Quillette on his resume he lists Independent Journalism Review, which was founded by a Republican operative and peddled a conspiracy theory about Obama. Brandon J. Weichert - right-wing MAGAt. Basically anybody who works cheap and supports the hereditarian or alt-right view of the world (and those are in agreement more often than not) will be published by Quillette, which presumably pays very little. Also of the sixteen writers above, only four are women, and that's a huge improvement over its gender ratio from a month ago. Of those, one, Nicola Wright is a hard-core right-winger, one is Pinker's #1 fan-girl (Saloni Dattani) and the other two were probably just thrilled to be published anywhere. I think Claire Lehmann has lots of empathy for low-information people. She just better hope she gets a plutocratic sugar daddy to support her amateur alt-right apologetics.